Home → Consumer Privacy → Is Google Knowledge Graph A Semantic Search Privacy Albatross? The Google Knowledge Graph is a feature which is starting to appear in some search engine results pages (SERP’s). These features were created to aid in topic exploration and in knowledge consumption. To help people explore a topic and narrow down the relevant information, image results are being displayed in a bar across the top of the page or in a rectangle, on top of the right sidebar. After the topic is narrowed down by clicking one of the Google provided image/description combinations the users is presented with a knowledge graph result, again placed on the right side bar of the results page. The knowledge graph result will provide high level details about the query (person, place, thing, etc.). Example of topic exploration results which display in a bar across the top of the page and solicit feedback to crowd source consensus for accuracy. This seemingly simple new feature may be a revolutionary step in the strive to transform information into knowledge. It’s almost as if it’s a window into what you should know about the topic. Although this is being tested and does not appear on every SERP, when it does appear, many times your bet with a friend will be settled right then a there and the need to click into various websites is completely eliminated. My experience has led me to more knowledge graph results during homework time, and the information typically provides answers to 80% of the assignment (7th grade). As with everything Google, it will improve over time, as searches, preferences, contexts, and intentions are tracked and interpreted across the world. The knowledge graph also makes use of the open graph protocol which is found at the center of facebook’s tracking platform. With the tremendous reach of Google Search and Google Analytics enabled domain’s, this product has the nuts and bolts to provide a refined experience with “semantic” search results, which ultimately gathers and presents information more intelligently. 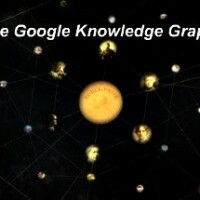 Will The Google Knowledge Graph Kill Website Domain Growth? Example of a drill down link that leads to a Google search result page which contains the Knowledge Graph result on the right. Will the internet become bland with Google attempting to understand the context and intention of each searchers search? Will everyday people continue to publish their blogs and websites if search users no longer access them from search results? With apps on the rise and search volumes decreasing will the barriers to entry when generating search traffic to a website change, will it be drastic? Most likely because accurate information about people and places will become easily gleaned from the Knowledge Graph, websites covering these topics will find it more difficult to advertise and garner organic traffic from Google. Because language isn’t always clear, everything is always moving and there are times when the intent is to seek breath of a topic, the knowledge graph will most likely only help with user experience. Google’s recent behavior forging into topic discovery, implementing the knowledge graph and offering their authorship program in combination with the Panda and Penguin updates, illustrates a strong resolve for quality information. This series of moves should remove garbage websites from their SERP’s and reward original content creators and additional bump in search ranking for those who also participate in the larger social conversation (G+, Wikipedia, etc.). All things considered, I don’t see the growth of domains changing, when you consider how low the barriers to entry for creating a domain are and seemingly that trend is continuing with additional distribution options. All in all Google’s recent moves will shape the internet in many subtle ways including forcing advertisers and publishers to create more value (original content) for search users to find them. Because Google is distinguishing intent and context of each query there may come a time in the future when Google is able to understand us better than we understand ourselves. The value of knowledge graph results are high because it provides deeper context than flat information (text across multiple sites) and gives users an efficiency tool to find information that is considered highly accurate = knowledge. The Knowledge Graph snapshot may include results presented with text, video and pictures, across multiple dimensions, like timelines, trend scales, maps, social interactions, etc.. This can make it much simpler to understand relationships and other complex elements of a topic. Exploring topics and expanding knowledge is a noble mission even if it is funded by advertising. Example of a knowledge graph result displayed in the Google search engine results page. This all sounds pretty cool, if you just look at it in terms of innocent internet research. But with advancements in data tracking technologies, there also comes a level of privacy invasion and greater control over the general internet-using population to contend with. Depending on your participation and use of devices, products and services, Google’s data tracking, storage, mining and retrieval could allow specific information to be drawn up about users from any point in time, since this tracking has begun. This creates a need for many to learn, who is controlling this information, who has access to it and how can they use it? Now more than ever people are wondering what trails are left about my habits and preferences, my locations, and other sensitive personal information? If we are using these intelligent systems and they are tracking everything, we must be open to the benefits and risks of technology in the same breath. Take stock. Read up. Think about your internet habits, for a wide variety of reasons this is a crucial privacy issue which requires solutions and knowledge to properly protect or promote your business and personal data. It’s said that with great knowledge comes great responsibility, that’s quite true in the case of Google’s Knowledge Graph.